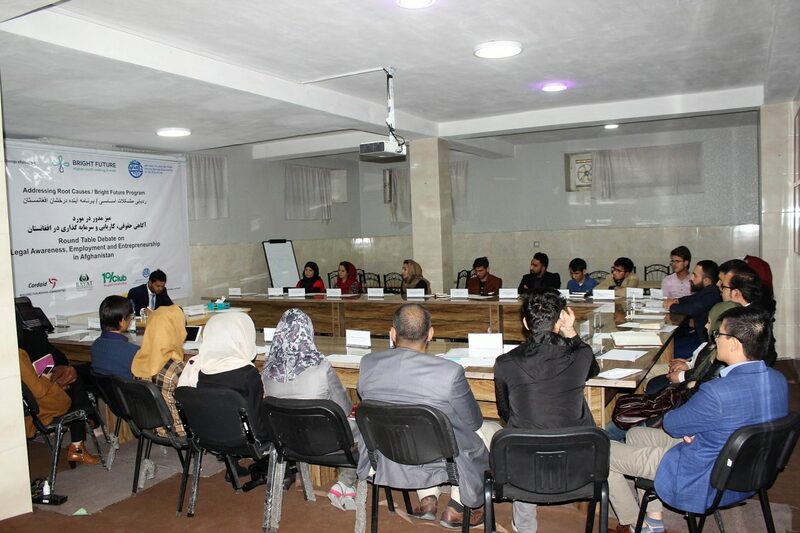 Hamida Barmaki Organization for the Rule of Law organized round table debate on Legal Awareness, ease of doing business and gainful employment in Afghanistan. ARC/Bright Future Program is a five year project funded by Ministry of Netherlands to focus on improving local economic prospects for urban youth in Kabul. This project is being implemented by Hamida Barmaki Organization for the Rule of Law and three other organizations. Twenty five beneficiaries of the Bright Future Program from among the Job Seekers, Start-ups and SMEs participated in the round table debate. The main focus of the debate was concentrated around Employment, Startups and SMEs. To begin with, the round table started appreciating the efforts of HBORL & its partners for increasing their capacity and skills of job seeking. Later on, discussion was focused on the challenges that exist in the market for job seekers. The participant SMEs showed ready ness to recruit most of their employees from the existing platform. In another part of the session startups and enterprises raised their concern about the unfair competition in the market, and the lengthy legal processes set for startups. In the sidelines of the session major challenges, opportunities and solutions were discussed and finalized. The table concluded that a detailed policy had to be developed by the government to support SMEs and Startups in the Afghan market. Meanwhile, it was suggested to arrange a similar debate with the representatives of the Government of Afghanistan, in order to share the concerns and ask for solutions. The session ended with distribution of certificates for the participants by the Director of HBORL Mr. Sayed Hameed Zia.